In 1973, Dolton Mayor Norman MacKay traveled to Capitol Hill to plead for federal aid in fixing a major problem that disturbed the quality of life in his close-knit, blue-collar suburb — a town that was in many ways a model of post-war America. But one big downside to life in the 4.5-square mile village just south of the city was freight trains that crawled through day and night. They often came to maddening stops, endlessly blocking crossings and transforming even short hops to the grocery, school or job site into logistical quagmires. “There is no ‘wrong side of the tracks’ in Dolton, nor is there a right side,” MacKay told the House Committee on Public Works. In the intervening 45 years, almost everything in and around Dolton has changed. The mills are long gone and factories thinned out, an early harbinger of the vulnerabilities of globalization that have become front and center in today’s political debates. That vision of upward mobility is a thing of the past, with steady paychecks harder to come by, the local tax base sapped and a shaken community laid vulnerable to plunging home values, real-estate scavengers and political carpetbaggers. Crime is up. Schools are struggling. The town can’t pay its multi-million dollar water bill. One constant, however, is the ever-present and ever-disruptive freight trains. The traffic overpass MacKay sought was never installed, and to this day life in Dolton revolves around the inconvenience. School children, their path home after classes blocked for long periods of time, plop down on the sidewalk to do homework. The impatient among pedestrians risk life and limb climbing through gaps in motionless train cars, sometimes passing youngsters from one side to the other while chancing that the train doesn’t suddenly lurch. Trucks and cars are forced to idle for what can seem like forever or search out long detours. Not only are the trains a chronic annoyance for Dolton’s 23,000 residents, they are an uncomfortable metaphor for a once-thriving community where progress has come to a halt. For more than two hours, a stopped freight train blocked an intersection on the border between Riverdale and Dolton in the south suburbs. 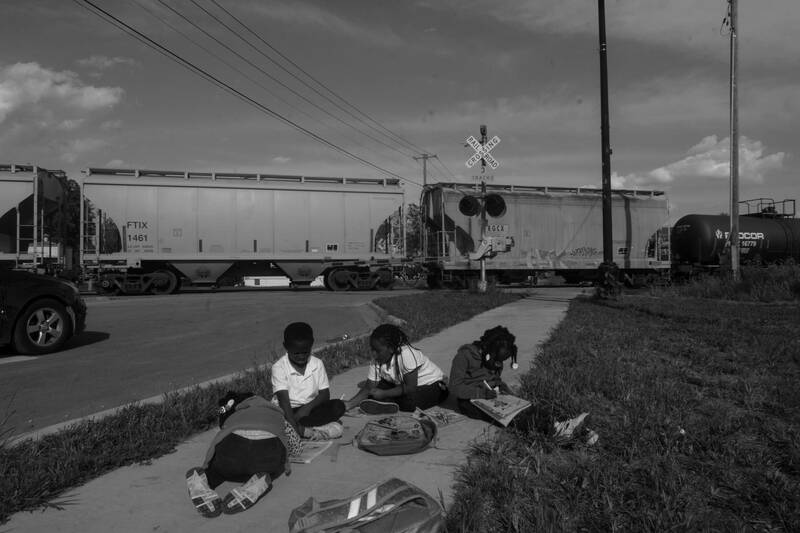 Trying to get home after school, children began to do their homework as they waited for the train to clear. 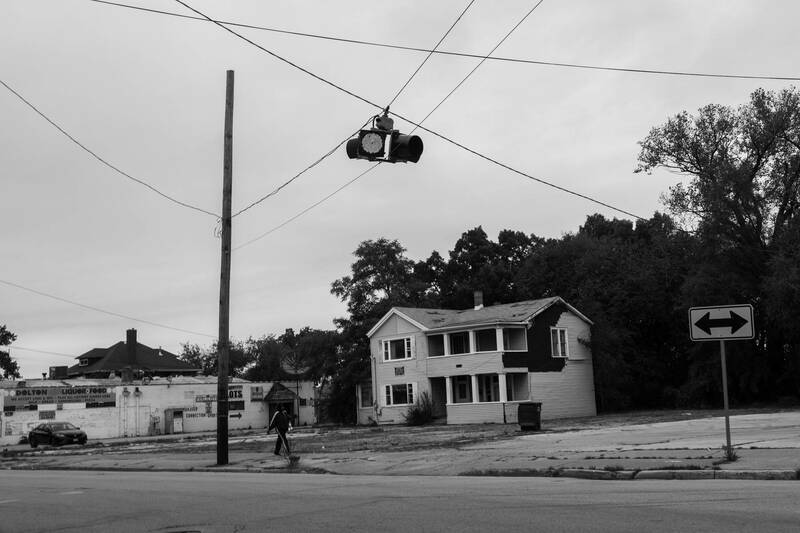 This is the story of how one small town became trapped in a downward spiral that poverty experts say follows a well-worn pattern of deindustrialization that leads to a disenfranchised economic class. Communities of color inherit a legacy of decline and then lack the resources, both financial and political, needed to turn things around. The focus is Dolton, but it just as easily could be Riverdale, Harvey, Dixmoor, Posen, Calumet City or other nearby suburbs that once were powered by steel and other industry but over time slowly coalesced into a broad swath of economic distress. In other parts of Illinois, such as North Chicago to the north or Maywood to the west, the details change but the problems are often much the same. Last year, a Brookings Institution researcher told Congress that for the first time in U.S. history poverty in the suburbs had eclipsed urban poverty. It was no one single thing, but a cascade of events that changed the fortunes of Dolton and its neighbors. The decline of manufacturing led to a loss of job and pay opportunities, which in turn fed a wave of white flight as longtime residents left and were replaced by African-American city dwellers lured by better, yet not too expensive, housing. But luring new investment to now majority black communities proved a challenge and housing values began to fall, taking down with them the tax revenues needed to keep up public services. Next came widespread foreclosures and an invasion of real estate scavengers who bought houses on the cheap, transforming a community of homeowners with a deep financial stake in their town into one of renters with looser bonds. All the while, the political fabric vital to turning things around continued to fray. Government stumbled amid patronage and gridlock, rendering even more challenging the task of drawing needed new investment. The same economic whirlwind that would come to upend the fortunes of Dolton also swept a fresh-faced young community organizer named Barack Obama into Chicago in the mid-1980s. Obama was hired by a non-profit to work with churches on the Far South Side as their parishioners coped with the unraveling of the domestic steel industry in once thriving blue-collar African-American communities. Wisconsin Steel closed its huge mill at 106th Street and the Calumet River in 1980, and U.S. Steel’s giant South Works plant along the lakefront in the South Chicago neighborhood was in the grip of a downsizing that would end in its outright closure in 1992. In its heyday, South Works had employed 18,000 and was a regional economic engine. When the manufacturing economy was booming, the line between Chicago and the suburbs to its south was roughly defined by race: African-Americans on one side and whites on the other. But the growing disorientation brought on by the departure of Big Steel knew no boundaries. What the future U.S. president was dealing with in Chicago’s Roseland and West Pullman neighborhoods, Garrett Ghezzi and his neighbors were experiencing for themselves on what long was the white side of the line in Dolton. Ghezzi, 70, a rare Dolton lifer, vividly remembers the before. “Everybody out here worked for the mills,” Ghezzi recalled as he reminisced with a handful of others at the self-proclaimed Old-Timers Club during their monthly get-together in the Village Café. It is one of the last surviving fixtures in Dolton’s now-sparse downtown. Gharret Ghezi talks about rising property taxes during a meeting of the "Old Timer's Club." 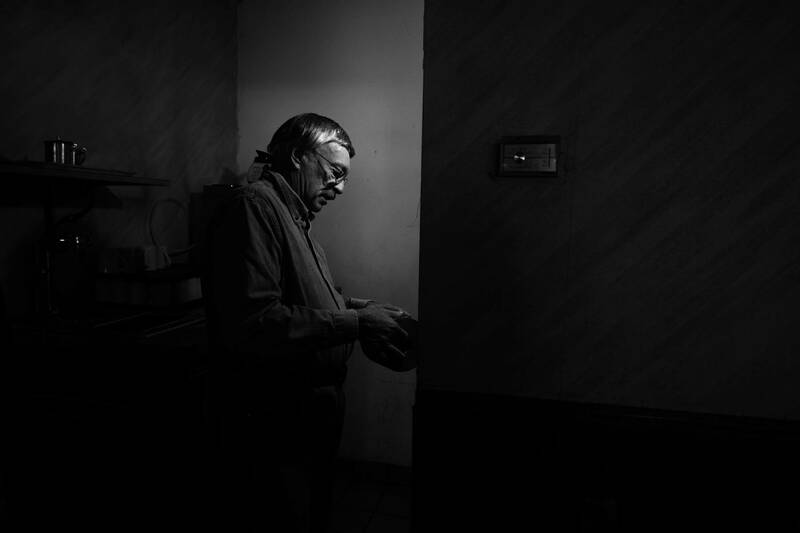 Garrett Ghezzi, a lifelong Dolton resident, unrolls paper to clean a spill at the Village Café in Dolton. Ghezzi moved into the the south suburb with his family in 1940s when he was a baby and he says he’s personally witnessed the south suburb’s decline over the past several decades. In Dolton alone, there had been brick making, metal parts, steel, aluminum and container factories — all now gone. Right across the border in Riverdale was the Acme Steel plant that employed well more than 1,000 at its zenith. The plant remains under different ownership, but the workforce is a fraction the size. Jack Rocha, a community development planner at the University of Illinois-Chicago, said the South Works closure accelerated what had already been a stampede for the exits in places like Dolton. “If people had the means, they went and they followed the jobs where they went,” said Rocha, who works with the university’s Great Cities Institute. That new “group” Ghezzi spoke of were black, many transplants from Chicago’s South Side. Author, “Dolton Tattler: Fact, Fiction and Folklore"
William Julius Wilson, a Harvard University sociologist and an expert on race and poverty in Chicago and other cities, said the decline of industry is often a catalyst for racial transition. “White families who are in a position to move depart regions that are in decline like Dolton where manufacturing jobs have dried up,” explained Wilson. And things snowball from there, he added. Data from the U.S. Census show Dolton went from having 42 black residents in 1970 to 487 by the beginning of the next decade to nearly 14,000 by 1990. Recent census estimates now peg the number at nearly 21,000 — 90 percent of the total population. The new residents came for the same reason their predecessors had earlier been drawn to the suburbs: bigger yards, safer streets and schools with a better reputation. But the plentiful economic opportunity that had made all that possible was also eroding. As Johnson, the former Harvey mayor, made clear, it didn’t happen overnight, but it happened. This century alone, the number of private-sector jobs located in Dolton has dropped by more than 1,800, or 43 percent, according to state data. Among working age Dolton residents today, just over 7 percent have jobs in manufacturing, according to census data. In former Mayor MacKay’s day four decades ago, the comparable share was 31 percent. In 1974, the unemployment rate among Dolton residents dropped to as low as 2.7 percent, state figures show. By the depths of the Great Recession in 2009, it had climbed to 13.6 percent. The unemployment rate has improved since, but still stands at nearly double the statewide average. Wages have also tumbled for those who do find work. The median household income in Dolton has dropped from $48,020 in 2000 to $44,511 in 2016, census figures show. That compares to more than $59,000 for the rest of Illinois in 2016. One of the biggest remaining employers in Dolton these days is the Ardagh glass factory, with a workforce of more than 440. Alesia Moses, who moved to Dolton from Chicago in 1996, started at Ardagh after being laid off from her union job with a parts supplier for Ford during the recession. Moses said she went from making $20 per hour with the parts supplier to $15 per hour as a pallet loader with Ardagh. “I don’t really care for that job but it pays the bills,” Moses conceded. Increasingly, those who do find work find it harder to get to their job. Public transportation isn’t nearly as convenient in suburbs like Dolton as it is in much of Chicago. Allen Babiarz is a career advisor with Business and Career Services, a workforce development agency. Over the summer, he helped lead an internship program out of the basement of Dolton Village Hall, connecting more than a dozen young adults with manufacturing jobs in the south suburbs. Many of those interns count on the suburban bus line, Pace, to get to work, something of a character builder of its own for Dolton residents. “Public transportation in the south suburbs is awful,” Babiarz said. “The buses just run down the main street. They don’t run to the places where people need to go — the companies where they are. 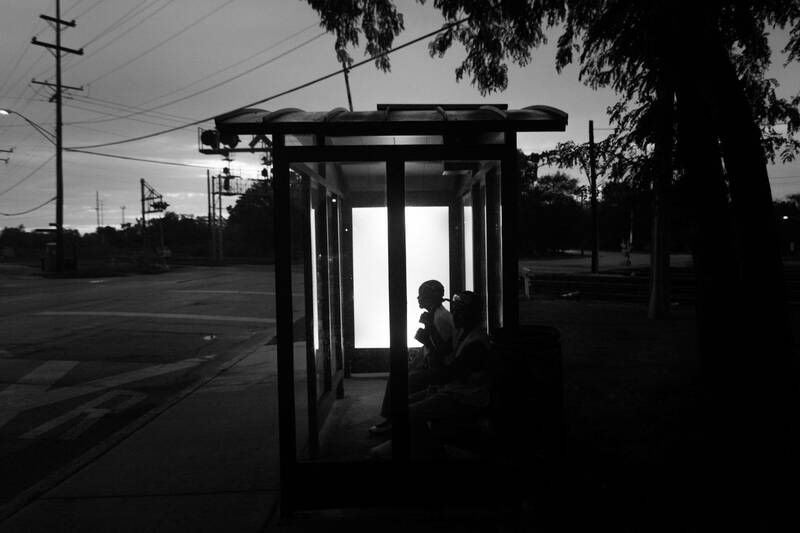 Two residents wait at a Dolton bus stop on their way to downtown Chicago. Taking public transit can be difficult in the south suburbs, with waits for Pace buses often lasting 30 to 50 minutes and commutes to the city taking more than an hour. Courtney Jones, raised in Chicago’s Englewood neighborhood, said he felt like a success when he tapped a small inheritance from his late mother six years ago to buy a split-level home in Dolton. It’s easy to see why. The house features backyard views of Dolton’s Riverview Park along the Little Calumet River. There’s ample space inside for himself, his wife and two of his four children, as well as a garage for what he calls his “baby”: a gleaming red 2004 Pontiac GTO. Souped up with racing tires and a Corvette engine, the sports car can hit 108 miles per hour in a quarter mile. He competes on weekends. “Just knowing that I can be sitting right there next to you and if I step on the gas I’m gone, you won’t see me unless you catch up to me,” beamed Jones, a former Marine. Still, Jones the speed demon long lived with the nagging fear that the home that has become his pride and joy could be gone in a flash. He fell behind in paying property taxes, threatening his grip on the house. It is an all too common problem for Dolton homeowners, a consequence of an eroding commercial base that then has a negative ripple effect on tax collections. To compensate for all that lost revenue, local governments then must impose astronomically high tax rates on homeowners to keep the schools, police, fire and other services going at a bare minimum. The composite property tax rates faced by Dolton homeowners are now more than triple those in Chicago. In 2017, Dolton taxpayers paid nearly $25 for every $100 of assessed valuation of their property, about double what the rate had been prior to the recession. In Chicago, which starts just north of the Dolton village limits, the most recent rate is a little more than $7 for every $100 in assessed valuation. All of which contributes to an ever steeper downward spiral, with businesses finding it a more expensive place to operate and homeowners a more expensive place to live. Vacant and abandoned homes multiply, real estate values sink and vital services are rocked by attrition and layoffs. Dolton Police Chief Robert Collins said staffing shortages have become so chronic that his department has been reduced to sometimes running “ridiculously unsafe” skeleton crew shifts of three officers and a supervisor. Riley Rogers, the current mayor, said not too many years ago the village had a police force of 66. Now it’s half that. “And we have a lot more crime,” Rogers added. Indeed it does. While violent crime has declined broadly across the nation over the last two decades, in Dolton it has increased. In 2017 alone, Dolton was plagued with 10 murders, 100 aggravated assaults, and 123 robberies, police statistics showed. Back in 1994, the comparable numbers reported by Dolton police to the U.S. Department of Justice were four murders, 61 aggravated assaults and 67 robberies. Not only is crime up in Dolton, but another consequence of the downsizing is that the policing that gets done is often less effective and sometimes more reckless. Earlier this year, an investigation by the Better Government Association and WBEZ revealed that police in suburban Cook County were never disciplined for shooting, killing and wounding others, including bystanders and even fellow cops. The suburban toll between 2005 and 2017 was 113 police involved shootings. Nine of the shootings occurred in Dolton and an outsized share in neighboring south suburbs. Dolton high school graduate Skyla Blue reads a poem she says she wrote at her high school's poetry club. 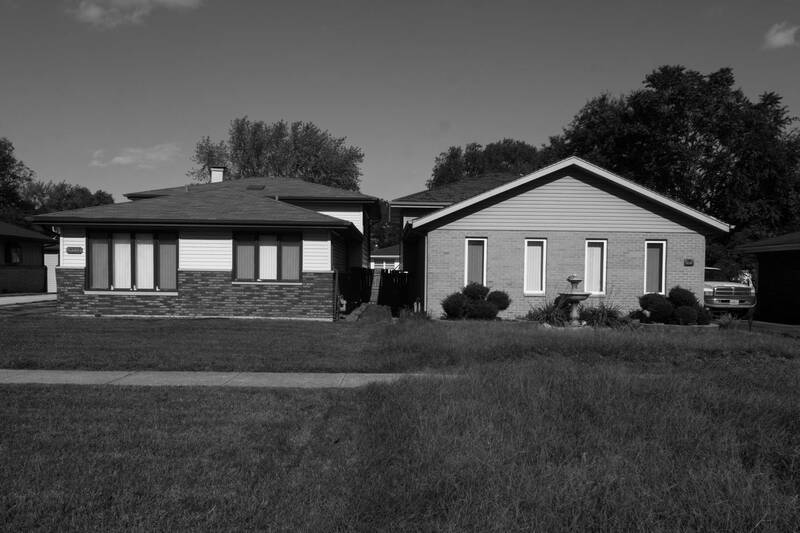 Vacant homes are common on the northern edge of Dolton’s once-booming downtown. For the first time in American history, poverty in the suburbs has eclipsed urban poverty. The long list of problems faced by Dolton hardly fits the stereotype of suburban America, but they are increasingly becoming the norm not the exception. In 2017, Elizabeth Kneebone, a poverty researcher then with the Washington-based Brookings think tank, told a U.S. House committee there were more people living in poverty in the suburbs than in cities. She said the largest growth in the numbers of suburban poor was in the Midwestern rust belt, with Chicago area suburbs logging an 84 percent increase between 2000 and 2015. Initially, at least, Jones couldn’t have seen it more differently when he bought in Dolton. His savings exhausted by the home purchase, Jones quickly missed tax payments and a tax scavenger firm swooped in. The cost to redeem the title to the house soared, with annual penalties as high as 36 percent tacked on to the cost of the back taxes, records show. Tax buying, the process of acquiring titles to homes by paying their past due taxes, has ebbed throughout much of Cook County as the economy improves. Not so in Dolton and surrounding communities where tax rates are high and property values low. In Dolton alone, equity firms and other businesses are now buying delinquent taxes at a clip double that before the recession, according to the Cook County Treasurer’s office. Among those whose delinquent taxes have been sold is Rogers, the Dolton mayor. Homeowners usually get their property back, but not before paying sizable fees and interest on top of the cost of the taxes themselves. In Cook County, the only towns experiencing more tax sales than Dolton are nearby Harvey and Calumet City, which suffer the same financial difficulties. All three are part of Thornton Township, which over the last decade has experienced nearly a quarter of all tax sales in Cook County, data from the county treasurer’s office shows. Martin Salzman, the attorney for Jones, said that things may be finally looking up for his client, who successfully petitioned the county for financial help in redeeming the title to his home. The award Jones received was $42,500, all of which he intends to turn over to the firm which bought his delinquent taxes. “People in the city are worried about what’s happening in the suburbs,” said Stalnos, whose organization supports industry in the area. Dolton resident Anastasia Gibson has weighed a similar calculation. She lives in her grandparents’ home and wants to move to a quieter neighborhood but won’t consider buying within Dolton because of the inevitable huge tax bill. During a Dolton village meeting in June 2018, BP Capital's Don Meadows defended the company's tactics. 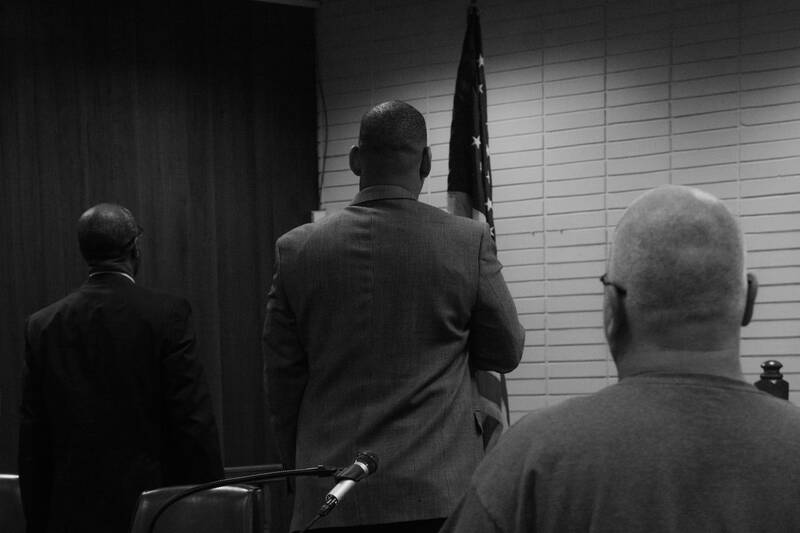 Dolton Village Board members salute the flag before a board meeting. Videos of board meetings, which have become notorious for infighting between trustees and the mayor, are often uploaded onto YouTube. Any town going through rapid economic and demographic change would benefit from steady yet visionary leadership. Instead of enlightenment, Dolton got the Shaws, twin brothers William and Robert, who put the old in old-school politics. In a formula that would later repeat itself in Dolton, the Shaws in the 1970s swooped in to seize the political machinery of the Roseland neighborhood on the city’s Far South Side after it turned from majority white to majority black. Bill became a state lawmaker, Bob a Chicago alderman, and neither were shy about using public resources to reward friends and punish enemies. The pair were so toxic, not just to political reformers but also many regular Democrats, that a colleague of Obama’s advised him to steer clear of the Shaws when the young organizer was learning the ropes in a community that lay in the heart of their political base. “They seemed certifiable,” Obama was advised. Gradually, the Shaws wore out their welcome in the city and in the 1990s came to eye Dolton as a new land of opportunity. Chicago, Cook County and the state had fallen subject to court decrees that banned patronage hiring. Dolton had not. Bill Shaw was elected Dolton’s first African-American mayor in 1997, but also held on to his post in the Illinois Senate, which he then used to steer millions of dollars in state pork spending to the town. Bill Shaw also hired Bob to be his $70,000-a-year inspector general charged with rooting out corruption in Dolton, though village ordinance made it clear that his brother and trustees were off limits. Other taxpayer-funded village jobs were steered to friends and family, and Bill’s son, Victor, was awarded a $1 million dollar construction contract to renovate a dilapidated village-owned assisted living center, a longtime patronage den. The deal eventually landed Victor Shaw in federal prison for tax fraud. Village finances, already precarious because of the decline of manufacturing, have been in a tailspin ever since. Kneebone, in a 2013 book she co-authored for Brookings, said Dolton and other south suburbs were especially ill-suited to weather the recession after years of deindustrialization and slow population growth. How poor is Dolton? The village, which buys its municipal water from Chicago, diverted millions of dollars that had been set aside to pay its water bills to cover the city’s day-to-day operating expenses. Chicago earlier this year sued Dolton for $7.9 million in delinquent water bills and penalties dating back years. Thomas McClinton, a retiree living on Social Security and wages from a part-time job, said he’s worried Dolton will jack up residential water bills to make up the difference. The Chicago lawsuit is far from the only legal challenge weighing on Dolton. Village leadership is a study in dysfunction, with the mayor, the majority on the village board and some former village employees swapping lawsuits against each other. In the November elections, Rogers successfully pushed a referendum to impose term limits on village board trustees, most of whom he is feuding with. The new term limits do not apply to Rogers. However, Dolton residents rejected another referendum backed by Rogers that would have cut the size of the six-member board. Even Village Hall, itself, is a symbol of Dolton’s troubles. It sits in a building that once housed a bank, right next to a nightclub shuttered after five people were shot there last year. Shouting and chaos at board meetings are the rule, not the exception. At a session in October, the microphones were turned off because the employee whose job it was to operate them had been laid off. Officials and spectators yelled over one other to be heard, prompting Collins, the police chief, to bark orders at residents to quiet down. At one point, a woman stood during the public comment period and showed trustees a necklace she was wearing made of dried snake heads, describing it as a fashion statement about their collective character. One of the sharpest disagreements at Village Hall turns on how to renovate hundreds of abandoned homes and get them back on the tax rolls, an enormous undertaking for any community let alone one racked by infighting and a sharp resource deficit. Over the objections of Rogers, the board majority voted last year to fire an intergovernmental agency for the south suburbs that had handled the task and replace it with Calumet City-based private developer B.P. Capital under a no-bid contract. Under the deal, at which Rogers balked, the village is to seize vacant properties and turn them over to B.P. for repairs and sale. In trying to block the transfer of properties to B.P., Rogers expressed reservations about the firm. That led four board members who support the company to sue Rogers. The matter is pending. At least three Dolton residents have come forward to complain about past dealings with B.P., including Pink Dorsey IV, who paid the firm $80,000 for titles to a dozen abandoned homes in nearby Markham two years ago. Dorsey said B.P never turned over the titles. “I’m just one small person and I got duped, but a whole village shouldn’t have gotten duped,” said Dorsey. “Somebody should have done their due diligence. … There's no telling what else somebody will try to sell Dolton." B.P. Capital’s president did not respond to multiple messages seeking comment about these allegations. Sandra Wells, a resident of Dolton for 19-years, said the flap over B.P. has led her to take a deeper interest in village politics. “I just kept on listening and listening and trying to figure out what’s your angle, why are you in here, what are you here really to do?” said Wells, referring to B.P. Wells, director of a non-profit that helps people in the south suburbs fix and buy homes, said she is frustrated by all the scheming that goes on in a village that has so little to give. 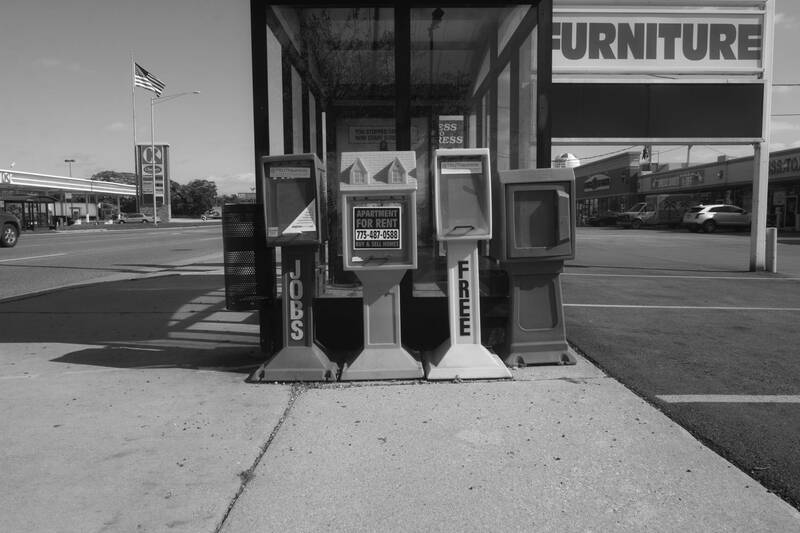 On Sibley Boulevard, Dolton’s main commercial strip, newstands that once offered job and housing information sit empty, replaced with “For Rent” signs. Deindustrialization throughout the south suburbs decades ago eliminated thousands of private-sector jobs. It may seem counterintuitive given its housing woes, but Dolton these days is a hotspot for real estate speculators — for all the wrong reasons. Crain’s Chicago Business wrote last summer that rehabbers and home buyers, lured by bargain prices, were snapping up Dolton properties. The crowd of speculators even includes a Republican member of the U.S. House, Adam Kinzinger of Channahon. Kinzinger, whose sprawling district runs nowhere near Dolton and whose home in Will County is 35 miles to the west, purchased two Dolton homes in 2015 for $116,875, real estate records show. A spokesman for Kinzinger did not respond to multiple messages seeking comment. Veteran real estate broker Anton Sharpe said few customers looking to buy in Dolton these days intend to actually live in the homes. The recession that began in late 2007 sent home values plummeting across the nation, but the recovery that followed in most places has passed Dolton by. The median value of owner occupied homes with mortgages in Dolton dropped by more than one-third between 2009 and 2016, according to census data — from $142,300 to $94,300. Across Illinois, the median home value stood at $187,300 in 2016, according to the census. Since 1970, the share of Dolton residents who rent homes rather than own has tripled, census figures show. The number of renters has increased dramatically since 2000, and by 2017 nearly one-tenth of the population of Dolton was comprised of residents benefiting from so-called Section 8 public housing vouchers used to underwrite rents with private landlords, federal data show. Section 8 holders comprise a minority of renters in town but it’s not unusual for longtime Dolton residents to conflate the two groups, freely scapegoating former Chicago residents for declining property values and rising crime. “The residents’ number one complaint, they’ll label it as Section 8,” said Muhammad, the village trustee. At the same time, the ranks of absentee landlords in Dolton has swelled. Over the last 12 years alone, the number of taxpayers who own Dolton residences but have out-of-state mailing addresses has increased by 520 percent, according to information from the Cook County assessor. What’s more, 13 percent of the single family homes and apartments in Dolton were vacant in 2016, census data showed. Most blocks in town suffer from at least one or two vacant or abandoned homes, typically small starter residences built decades ago. The signs of neglect are unmistakable: boarded windows, peeling paint, decaying roofs. Yards are overgrown and mailboxes overflow with uncollected letters, bills and fliers. Real estate broker Anton Sharpe talks about what declining housing values mean for Dolton after the 2008 housing crisis has meant for the village. Two homes on Lincoln Avenue in Dolton, a suburb south of Chicago. Eyesores aside, the far bigger problem posed by all those empty houses is that it translates into fewer people paying property taxes, putting even more upward pressure on the already enormous tax bills for those who do. The change has been jarring for 73-year-old Willie Cotton Jr. He arrived in town in 1997, buying a modest single-family house near Roosevelt Elementary School for less than $100,000. Cotton’s wife died in January and he now lives there with his adult son. Dolton’s proximity to Chicago was once a selling point for the village, as that long ago marketing pamphlet made clear when it talked about being “close enough” for industry and “far enough away” for suburban living. In recent decades, however, that proximity has led to a new set of challenges aggravated by diminishing resources and overwhelmed leadership. Wilson, the Harvard sociologist, said that poorer inner ring suburbs have increasingly become destinations for inner city residents seeking cheaper housing and improved quality of life. Perhaps nowhere in Dolton is the impact of that influx of Chicagoans more evident than in the schools, which in recent years have enrolled hundreds of transfer students from often underperforming Chicago Public Schools, according to Illinois State Board of Education data. 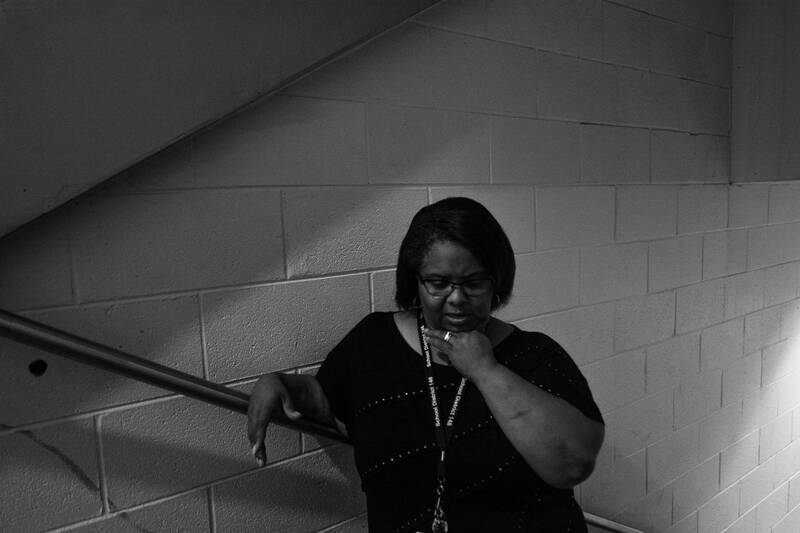 Social worker Sabrina Peden has worked in Dolton-Riverdale School District 148 for 18 years, the last three at Lincoln Elementary School. About three-fourths of school children were from low-income families when she started in the district, but now almost all are, state records show. District students recently scored less than half the state average on statewide achievement tests. Until the last few years, Peden explained, she never felt compelled to call a state crisis hotline to report students who might harm themselves or others. But last year, Peden said, she placed a dozen such calls. Dolton’s older students funnel into Thornridge, a high school long ago all white, integrated in the late 1960s, and now once again segregated with a student body that is 96 percent black. Nearly half of all Thornridge teachers missed 10 or more days of school — a problem afflicting schools in all three districts that serve Dolton, according to the most recent available data. Several Thornridge students, graduates and their families complained about learning from substitutes — or no teachers at all. Cheyenne Moses, the 17-year-old daughter of Dolton glass factory worker Alesia Moses, began high school at Thornridge but now attends its sister high school, Thornwood, in South Holland. Educators in the school districts that serve Dolton acknowledged they have a problem with high teacher absences and low student test scores. They also expressed frustration with having to reconcile increased needs with narrowing resources. Peden was talking about schools, but she just as easily could have been describing far broader challenges faced by suburbs like Dolton still struggling to redefine themselves in the wake of years of economic upheaval. Home ownership down, tax revenue down, business investment down, job opportunities down. That is not the traditional portrait of an American suburb, and Dolton may in some ways be an extreme example. But in 2018, it is also a cautionary tale. Miles Bryan contributed reporting. Edited by Bob Secter. Digital production by Paula Friedrich and Patrick Judge. Graphics by Patrick Judge.